Writer Tony Bedard should not take up a side job writing Internet memes. As a long time reader of the Internet, I consider myself fairly well versed with the world of memes. I think I know what I’m talking about. 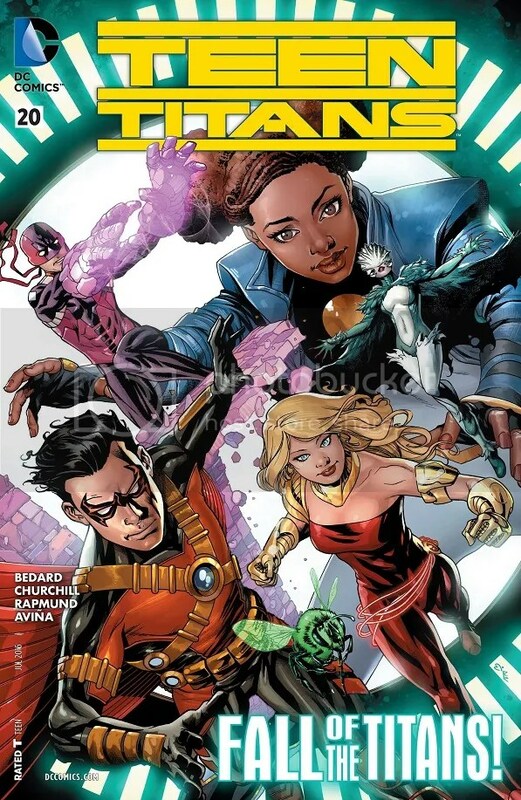 Bedard dazzles us with a few in this new issue, as the Teen Titans take on this instantly dated phenomenon. I’m not even sure why they bothered. Teen Titans is a lame duck comic book. With a complete revamp on the way in Rebirth, I’m not really sure why Teen Titans is still shambling along like it is. Maybe if we were looking at a Scott Snyder/Greg Capullo-style climax, or if we had any sort of ongoing story to tell, or even if the comic was still using its original numbering and DC Comics wanted to get to the magic 52nd issue, then maybe I would understand why Teen Titans is still putting out new issues ahead of Rebirth. But there’s nothing here. Heck, this is Bedard’s first issue on the series. He’s clearly some kind of pinch-hitter brought on to keep the series on life support before the switch. Is it sales? Does Teen Titans sell enough to justify scraping together a few more crummy issues over the next few months? Maybe if they were using these issues to build up to the Rebirth changes, I would understand. But that’s not happening either. This issue could be any regular issue of Teen Titans. There’s an awkward training sequence followed by the aforementioned memes plot, and the arrival of a sudden, random villain. Nothing in this issue signifies the end. Nothing in this issue signifies a new beginning or a new direction. Teen Titans #20 is weak filler. And it’s filled with some weird storytelling choices. The issues opens with the introduction of some crappy supervillain memes. I guess I’m assuming Bedard wrote them. Artist Ian Churchill could also be responsible. 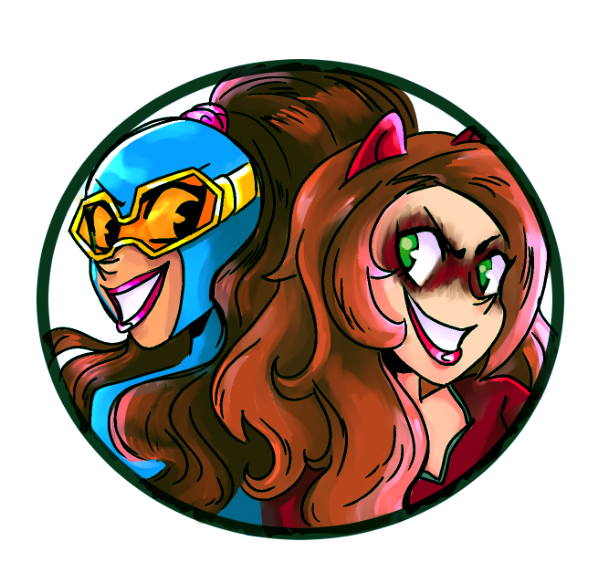 They’re kind of a travesty, and they mock villains of the DC Universe. 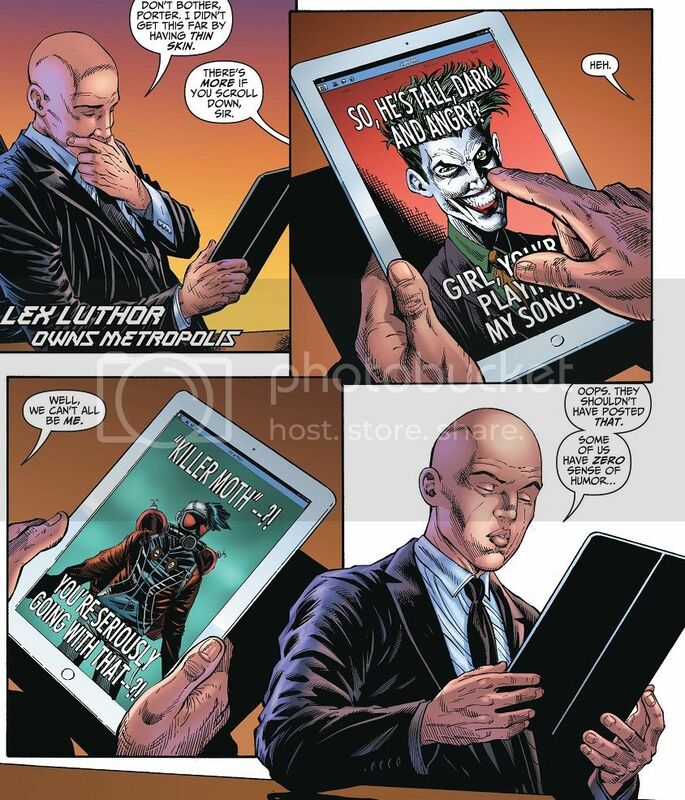 Like Lex Luthor, who is getting a kick out of reading some of the others. He’s a little tickled by the meme, because he’s got a sense of humor. 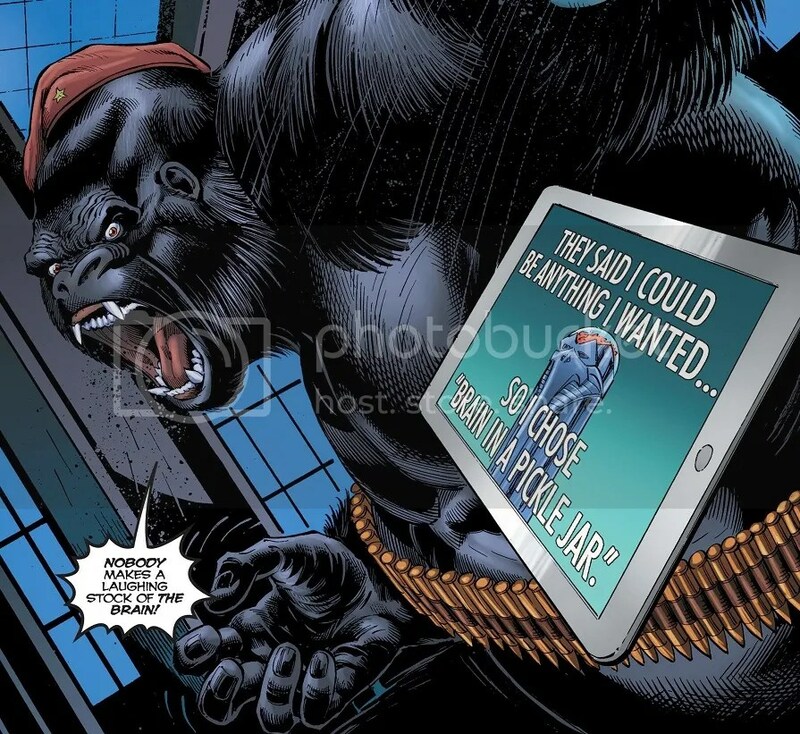 But Monsieur Mallah does not. The Brain tells Mallah to chill out, but Mallah is an emotional gorilla. He can’t just chill out when somebody insults his love. Brain relents and agrees to go out and cause mayhem to the person making these memes. Maybe your sense of humor is different from mine, but man, these are really crappy memes. They’re not funny, witty or clever…kind of like this issue of Teen Titans as a whole. Whoever made them put in the barest amount of effort. And then in the story, we’re led to believe there is a single person making and posting these memes in one location. That’s not how the Internet works. That’s not how memes work. Are you telling me, in the entirety of the DC Universe, the only Internet memes ever made about the superhero or supervillain community are these handful? And everybody from Lex Luthor to Monsieur Mallah is looking at them? Sigh. We then cut to the Teen Titans conducting a rather strung-together training session, still in Greece. It’s Red Robin against everybody, to show them that they’re not prepared. It’s written like this is the team’s first ever training session, because the Titans seem shocked and hurt by Red Robin’s methods. He shocks Wonder Girl through her lasso. And he zaps Power Girl with a flash bomb. 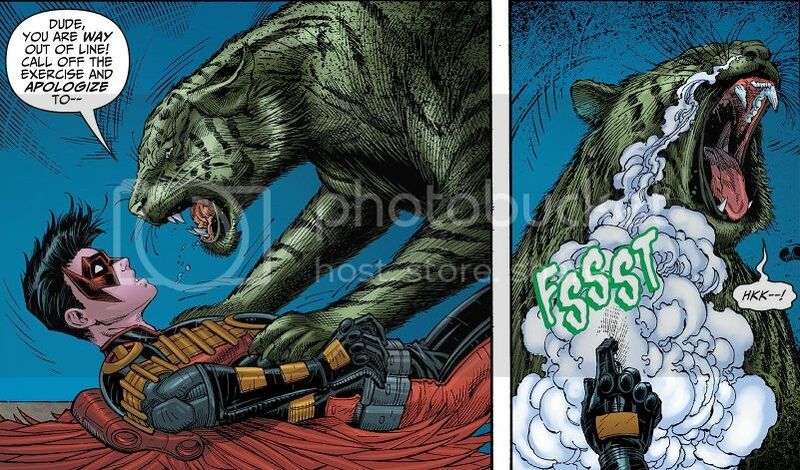 Beast Boy gets hit with some gas. ‘Call off the exercise and apologize’? Really? Red Robin has done the minimal amount of damage in the most haphazard kind of way, but the other Titans are apparently taking it personally. Have they never sparred or trained together before? Have they never sparred against Red Robin before? Beast Boy quickly changes into a bug without lungs, so he won’t breath the gas, and Red Robin traps him in a jar. He tosses the jar aside, and Bunker immediately panics and dives to grab the jar. Robin knocks Bunker in the head when he’s distracted. Also, it was an unbreakable jar. Robin totally knew Bunker would be distracted by his bromance with Beast Boy. He literally says this out loud. So the Teen Titans have so far spent this issue being casually taken apart by Red Robin, then they whine about it while Robin explains how he took them apart. Good times. Then Robin gets a phone call from Batman. This might be the weirdest part of the issue. 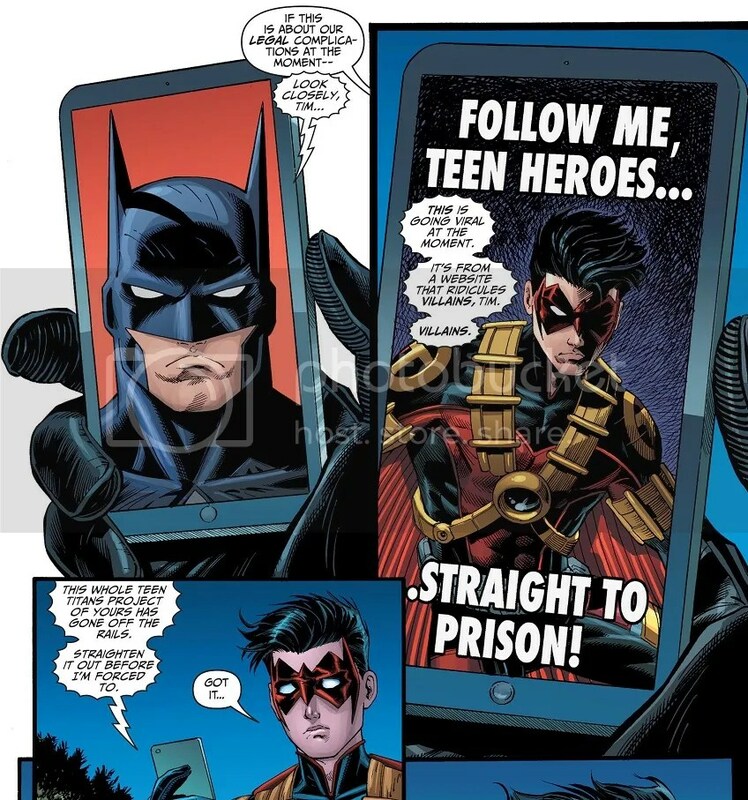 Robin thinks Batman is finally calling him about the fact that the Teen Titans are outlaws on the run. Nope! Batman is calling because Red Robin is being featured in those memes, and that those memes normally target villains, and it makes the Teen Titans look bad. That’s what Batman’s calling about. He totally saw some Internet memes making fun of Red Robin and wants Red Robin to straighten up and fly right. Some really crappy Internet memes, by the way. Like…who would find that funny? Are there communities on the Internet getting a good LOL out of the idea that Red Robin and the Teen Titans are criminals? How is this funny? How is this a memeable joke? Anyway, Red Robin’s idea for fixing this problem isn’t to undo the public’s perception that the Titans are criminals or anything like that. Instead, he takes the team to New York City and tracks down the one specific Internet user who is making and posting these memes. He plans to sweet talk the guy into doing good PR for the Teen Titans…either that, or they’ll pull his plug. So either you’ll take over his racket or rub him out? Really? That’s your plan? Rather than solve the overwhelming problem and get your Teen Titans experiment ‘back on the rails’, you’re going to take out the offending memes? Do you have any idea how the Internet works? Have you never heard of the Streisand Effect? It’s a crappy Internet meme. It’ll get downvoted after a day and nobody will ever give it a second thought. But nope! Red Robin’s genius plan is to try and erase something off the Internet. Surely if these memes no longer show up on Batman’s front page, he won’t have any reason to doubt Tim or the Teen Titans. Anyway, so Red Robin and Wonder Girl break into the guy’s apartment and find out that the Brain and Mallah are already there and have attached a mind control bot onto his head. He doesn’t appear to be anyone important, just a regular-looking dude. And I’m not sure why they want to mind control him instead of kill him. I guess they had the exact same plan as Red Robin. Apparently, controlling this one, single Internet meme-maker is the key to…something? Either way, a giant gorilla and an immobile brain in a giant, silver chassis are able to get the drop on Red Robin and Wonder Girl. Mallah slaps a second mind control bot onto Wonder Girl’s head, and they order her to attack Robin. Teen Titans #20 is just treading water, and doing so poorly (pun intended). I’ve always been a fan of Tony Bedard, and he writes a perfectly serviceable comic. But it is really, really directionless. From a vague understanding of how Internet memes work, to a plot that focuses on Internet memes, to the very memes themselves, this issue was just silly bad. None of it is really played for comedy. This issue is as serious as Teen Titans has always been. But it features a scene where Batman calls up one of his sidekicks to inform him that he’s being teased on the Internet. 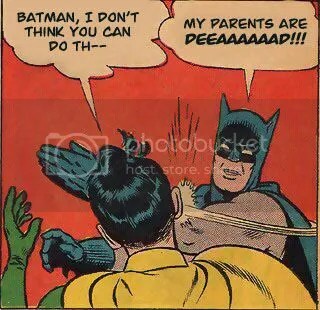 Hopefully Batman doesn’t get wind of this classic meme. There’s probably a great story out there about how the Internet works in a world full of superheroes. What would memes and Internet jokes really be like in the DC Universe? Bedard and Teen Titans don’t have the time, energy or inclination to actually research and create that world. They’ve got to pop out a few more issues before the reboot. So let’s kill some time with a weirdly written training sequence. And let’s bring in the Brain and Monsieur Mallah! They’re classic Titans villains who have never tangled with the team in the New 52. Maybed Bedard has always wanted to write a Brain and Mallah story? I can’t fault the guy for that. And Ian Churchill remains one of my favorite comic book artists. I love his skill with detail. The New 52 Teen Titans only have a few issues left. I kind of wish they’d get really weird with it. There should be nothing holding a pinch-hitter like Bedard back. But maybe editorially told him to just keep it light and don’t do anything to rock the boat. Posted on May 27, 2016, in Comics, DC, Reviews and tagged Teen Titans. Bookmark the permalink. Leave a comment.